I have embarked on a quest to read through the Star Wars Expanded Universe once more. Be sure to check the linked text there to see other posts in this series. 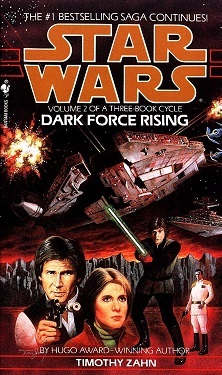 Here, I look at Dark Force Rising by Timothy Zahn. Here we are at the midway point of the famed “Thrawn Trilogy.” Does it continue to hold up as well as the first, Heir to the Empire? In the book, the primary thrust is Thrawn’s–and the Empire’s–search for new ships, which comes to be focused on the “Dark Force”–a mysterious, missing fleet of Dreadnoughts. As the race is on to find where these ships are, Princess Leia travels to the Noghri homeworld and discovers the great injustices that have been dealt to this alien people. What Zahn perhaps does best of all is the introduction and fleshing out of numerous secondary characters like the Noghri, Senator Bel Iblis, Mara Jade, Talon Karrde, and more. These characters each have intriguing backgrounds and are genuinely deeply important to the story. This is something I recall not happening in all the Star Wars books as secondary characters are often little more than window dressing for the main characters’ struggles. Here, however, readers are freely introduced to a wonderful cast of characters who have motivations, insights, and their own struggles to go along with those of the main characters like Luke, Han, and Leia. The Noghri and their planet, Honoghr, are the other central part of the plot, and Leia’s interactions there are both interesting and true to her character. Zahn did an excellent job setting up this world and its inhabitants as a stage for current and future conflict. Like Kashyyk in Heir to the Empire, Honoghr seems like a fleshed out world rather than a mere stage for events. Thrawn in this book continues to be an interesting character, but his tactical genius seems to be slipping. The assumptions he made related to the Noghri ended up being mistaken, which is surprising given how much Zahn had previously emphasized his cultural intuition by means of studying the artworks of various peoples. However, this may not be a bad thing as it is clear Thrawn needs to have some weakness, and the most believable one is almost certainly that he would out-think himself. The biggest problem in the book is, like the first, the rather large number of awfully “convenient” circumstances. Here, however, it is the existence of the “Dark Force”which suddenly everyone knows about and is interested in. Lando, Karrde, Thrawn, and others all have some knowledge about this fleet. Now this isn’t absolutely extraordinary, but what is extraordinary is that after all this time, more than one person just happens to show up who knows where the fleet is, just when the Empire is looking for new ships. It’s just a little too much. It’s kind of hard to think of one because there weren’t too many, but I did enjoy R2-D2’s attempt to fight alongside Luke. Dark Force Rising isn’t as flawless as Heir to the Empire, but continued focus on secondary characters, great world-building, and fast-paced action still make it among the cream of the crop for Star Wars books. William Riker is captured on a mission in which he and other Starfleet personnel were trying to learn more about a people they were going to make first contact with on behalf of Starfleet. The crew of the Enterprise attempts to initiate contact and get Riker back, but factions within the planet’s people themselves try to prevent the change that they are afraid of. Finally, Riker is involved in an altercation as an alien tries to fake his own murder and blame it on Riker. Riker is rescued and the man treated, but ultimately the people decide not to enter the wider universe yet. Wow, at some points this really felt like an episode of The Original Series. The alien coming on to Riker, the campy overall feel of several scenes, each hearkened back to TOS. This can be a good thing, but here it felt deeply out of place in an episode that needed to be taken more seriously in order to really reach the heights it aspired to. The campiness takes away from what is a serious premise and insight into the way Starfleet operates in making contact with others. Frankly, it is the latter part that really carries the episode. It’s such a fascinating look into the comings and goings of Starfleet life. We knew generally that of course they made contact with other peoples, but never before (at least in TNG), have we seen this in action. It was so interesting to see this that it, again, felt very jarring when the tone was changed from serious to tongue-in-cheek and campy. However, even with the occasional difficulties, this was a great way to experience Starfleet life in a way we hadn’t really seen before. What did you think of the campy parts? I’d love to read your thoughts in the comments. The Enterprise investigates the scene of another Starfleet ship which has been stuck adrift. Everyone on board other than one Betazoid is dead, but there is no apparent explanation. Unfortunately, the Enterprise also finds itself stuck adrift and as the crew tries to get underway again, they also start to experience hallucinations, erratic behavior, and fear. Dr. Crusher finds that they aren’t having dreams–except for Troi. Troi’s dreams turn out to be a message and she works with Data to set up a way to escape from the situation. It’s hard for Star Trek to do horror, but “Night Terrors” shows that TNG is capable of at least maintaining a very strong sense of foreboding throughout an episode. There are some moments that are creepy, and apart from some cheap attempts at thrills–like the snakes in Riker’s bed–most feel genuinely intense–like the scene with Crusher in the morgue. It’s an impressive effort made even more noteworthy because it could have gone so poorly. It could have been very cheesy, and it wasn’t. Kudos! The main plot is fairly thin–the Enterprise must get unstuck. But that doesn’t really undermine how thrilling the episode was overall. A very cool episode, even if it is a throwaway plot. The Enterprise must deal with a hostage situation that involves a whole planet being held against a contract which allegedly places them in slavery to a mythical figure–Ardra–in exchange for the 1000 years of peace they have enjoyed. Ardra herself allegedly shows up and has lots of tricks to back up her claim. However, Geordi’s diligent work leads to the discovery of Ardra’s ship and an epic showdown as Picard embarrasses the woman claiming to be Ardra in court through use of her own powers. “Devil’s Due” is an interesting premise. What would happen if someone used the powers of a starship for something like, say, imitating a malevolent deity? It seems like the perfect con, and “Ardra” almost gets away with it here. 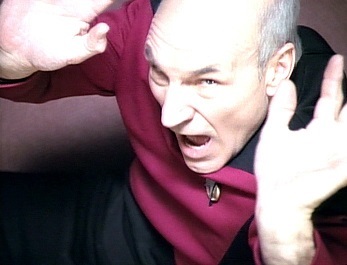 Picard, however, is determined to intervene. The main plot is nothing special–it just serves to set the stage for Picard and Ardra to have a showdown over the fate of a planet, with Data moderating of course. It’s fun, and even though we know Picard will ultimately win, Ardra gives him a run for his money and some good points of hilarity are found through the episode. The incredulity factor is a bit high in some of Ardra’s uses of her ship. How, for example, did she make the Enterprise disappear or move? How did she show up in Picard’s quarters and disable functions of the computer? These are largely left unexplained. It’s not like we need a thorough explanation of everything, but it would have been interesting to see how she managed to get so powerful in these specific ways. “Devil’s Due” is a solid episode. It’s not spectacular–the premise is a bit too thin for that–but it’s the kind of fun filler episode that is pleasant to have come along once in a while. The Enterprise encounters something that causes the crew–sans Data–to go unconscious and wakes up apparently 30 seconds later. However, as the crew continues to try to figure out what happened, a number of incongruities in the story pop up, and Data falls under suspicion for concealing the truth. He finally admits to Picard that Picard himself ordered Data to deceive them, and a powerful entity is at work here–one that will destroy the Enterprise simply for knowing about its existence. Picard convinces the entity that they will succeed if they try again, and they proceed. This time, no clues are left behind and only Data knows the truth in the end. “Clues” is another one of those episodes with a really solid mystery at its core. What happened in the lost day? Why is Data apparently concealing facts? The episode also introduces the various little inconsistencies in the story in ways that continue to build the mystery rather than revealing it all at once. At the beginning it seems like it is some probably benign mishap that Data possibly suffered, but as the episode continues a sense of foreboding builds that is all-too-often difficult for a show like TNG to pull off. The best part about this episode, though, is that unlike with the recent “Future Imperfect,” “Clues” manages to wrap up the story satisfactorily. Simply seeing Data, knowing that he will take the terrible secret with him forever, is an extraordinarily bleak ending that wraps the episode up perfectly. 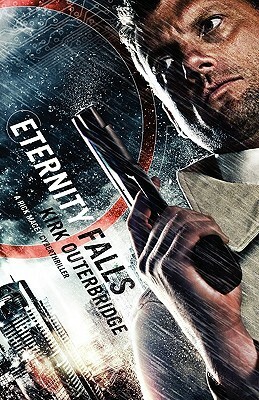 Eternity Falls by Kirk Outerbridge is a cyberpunk thriller with quite a bit of depth and insight. There will be some minor SPOILERS in this microview. Rick Macey is a PI contracted to help find out whether there was something untoward in the death of a woman who’d received the Miracle Treatment–something which should have made it impossible for her to have died of natural causes. In the process of the investigation, he finds himself thrust into a struggle of deep import both in his personal life and to the world at large. Alongside Sheila Dunn, a prominent executive for the company that makes the Miracle Treatment, he dives into a stirring adventure that will leave readers wonderfully breathless. There are themes of religious extremism and violence, mystery, questions about human nature, and action throughout. 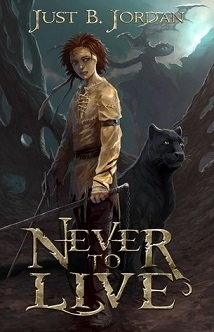 A prominent theme throughout the book is that of faith (or lack thereof). Macey himself struggles with his own deconversion in a world in which belief in deity seems absurd. When confronted with someone else who is a firm believer, the book takes another surprising turn and the moral and theological questions it raises are remarkably interesting. There were several moments I was at the edge of my seat, wondering which direction Macey might go on questions that are of real life import for persons of faith. Outerbridge writes great action scenes as well, and a climactic conflict is particularly page-turning. Not all authors do possess a gift for making fights interesting, but Outerbridge succeeds here in a big way. Two downsides in the book are worth mentioning. First, there are a few moments in which gender stereotypes are unfortunately perpetuated. Macey, at one point, complains inwardly about “how quickly their [women’s] feelings got hurt…” (87). Moments like this are few and far between, and may simply be blamed on a kind of stereotype in Macey’s own head rather than something Outerbridge puts forward, but they are still unfortunate. Second, the technology, at times, is not sufficiently explained. Of course with anything sci-fi, there will be suspension of disbelief, but too often it seems that something is “hacked” into or somehow disabled without any description of just how this might have been accomplished. This problem is made more evident by the times Outerbridge does offer such descriptions, because they are quite good and mesh well with the expectations for cyberpunk. Overall, Outerbridge seems to have hit gold with Eternity Falls, and this reader, for one, will seek out his other works. Kirk Outerbridge’s Eternity Falls is a unquestionably fun romp on a journey of mystery, faith, and exploration of the human psyche. Data is recording his day aboard the Enterprise in order to send it on to Starfleet to study the observations of an android. The day involves Chief O’Brien’s marriage to Keiko, Romulans and a potential diplomatic emergency, and the standard routines of Data’s day. It turns out the ambassador the Enterprise is ferrying is actually a Romulan spy that is now returned to them, and Data acts as father of the bride in Keiko’s marriage to O’Brien (after some ups and downs). An episode narrated by Data! What could possibly go wrong? Well, actually, not much. It’s a very solid episode that introduces Keiko–O’Brien’s fiancee/wife–along with following Data throughout a day. The Romulan subplot (more on this below) is introduced to add suspense. Data’s breaking of the news regarding Keiko’s decision to cancel the wedding with Miles O’Brien was hilarious. The integration of humor throughout the episode helped keep it from ever getting bogged down. Data learning to dance with Dr. Crusher was another fun and very believable bit of the story. The best part of the episode is how it simply shows what Data does throughout a day. People who have watched the series this long are necessarily drawn to learning more about the “mundane” activities of the ship, and “Data’s Day” is simply fantastic at showing some of these details. One is the way the ship powers down the lights for the “night watch”–a nod to a potential human need to experience “night” even aboard a ship going all over the galaxy. Little tidbits like these are welcome and infuse TNG with some reality that is totally endearing. Perhaps the only real shortcoming of the episode is that it tries just a little too hard. The Romulan plot is frankly superfluous. Though interesting, the episode could (should) have jettisoned it without any loss. Simply following Data’s life throughout one day would have been enough without the attempt to add suspense to the situation. That said, “Data’s Day” is just a really fun episode that blends a conspiracy, a wedding, and a standard day into one. The insights into life on board the Enterprise was welcome and surprising. It’s so fun to see the show succeed at an episode that could have gone terribly wrong. Well done! A Cardassian ship attacks the Enterprise, claiming the Federation has violated the treaty with the Cardassians and that they are at war. After tensions are calmed momentarily, Picard is instructed by Starfleet to investigate and the Enterprise brings aboard some Cardassians as they explore the possible misunderstanding. Miles O’Brien gets even more screen time in this episode and that is a very good thing. He really does not like the Cardassians, though through the episode he seemed to be in denial of this fact. Finally, he comes to realize he hates his own confrontation with killing and the atrocities of war. He integrates this into his discussion that convinces the renegade Captain Maxwell to stand down in a frankly stirring scene reflecting the loyalty bought by side-by-side struggles. O’Brien is just spectacularly acted by Colm Meaney and I can’t wait to see more of him. The ascent of O’Brien in TNG has come to glorious fruition and to see him carry an episode in many ways was just fantastic. The moral questions found in the episode related to war are also worth mention. Retaliation is not justice, and the episode does a fantastic job of introducing this concept through its narration of events and the use of Captain Maxwell. The increasing tension as we watched Maxwell blow away Cardassians on-screen was done really well simply by showing red blips disappear. It was a great juxtaposition of simplicity–blips representing ships–and reality–those ships were 650 deaths. Questions of the morality of these actions were not overdone and the subtlety with which they were conveyed was done quite well. The Cardassians themselves are an intriguing race. Seemingly warlike, but not tempered by the same concepts of honor that the Klingons have or the subtlety of the Romulans, they present what feels like a more imminent threat than some others introduced in the series. The final conversation between Picard and Gul Macet was a great way to close out the episode and show that some ambiguity remains in the relationship between the Federation and the Cardassians. “The Wounded” is an impassioned narrative that deserves its place among the great episodes of TNG.